Beautiful Nation will reach over one million students through its education partners Reach the World and Agastya alone! To support the project's mission the founding members of Beautiful Nation have raised over 200K in volunteer hours, and 100K in-kind donations. Plus, the project has 30K in pledges for school and passage sponsorship, short-term crew positions and sponsorship! We still have a ways to go before we reach our fundraising goal of 280K and we need your help to get there! 1. Join the Beautiful Nation Social Network! The project aims to reach students around the globe using geosocial media and effective digital media storytelling through its social network on a boat. 2. Spread the word! Share beautifulnationproject.com and beautifulnationproject.org in your social media streams. Follow us on Facebook, Twitter, and Tumblr. Email a link to our media kit to your contacts. 3. Sponsor a school or classroom! Students following the journey through the Beautiful Nation Social Network get to participate in online discussions, video calls and live broadcasts, as well as receive customized content on topics related to social studies, geography, science, technology, engineering, mathematics and interdisciplinary studies. Your donation to a Content Channel will go directly to sponsoring a school and ensure a rich experience for student participants. Read more about sponsoring a school. 4. Join the ship! Members of the Beautiful Nation Social Network can submit a proposal to join the ship as a short-term crewmember. Short-term crew members will contribute their expertise and passion to content produced during their stay aboard the ship. Contact us using the form below to learn how to submit a proposal. Read more about joining Makulu as a short-term crewmember. 5. Sponsor a short-term crewmember! Do you know someone made for this journey? An expert educator, an aspiring environmentalist, a young person dedicated to discovery and learning? Contact us using the form below to set up a scholarship for a short-term crewmember applicant today! 6. Make an in-kind donation! Makulu has been generously donated to Beautiful Nation for the duration of the journey by its owner, Mr. Yngve Gustaffson. The ship is being outfitted at the Atlantic Highlands marina in New Jersey for the expedition. The founding members of Beautiful Nation have dedicated 15-20 hours a week to developing the project and restoring the ship after Hurricane Sandy. Supplies, tools or materials are welcomed donations! We happen to have a wish list with West Marine! Contact us using the form below and we will send you access to a list of items we need. Read more about making donations. 7. Make an investment! Beautiful Nation is actively seeking a global media partner and corporate and business investments to support expedition costs, content production, school engagement, and management of the Beautiful Nation Social Network. Official sponsors will receive international recognition for their contribution with opportunities ranging from logo display on the ship and sails to product placement and advertising within the Beautiful Nation Social Network. 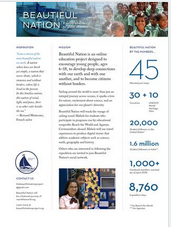 Read our media kit and contact Tonia Lovejoy at tonia@beautifuilnationproject.org. 8. Host an Event! In the fall of 2013 Beautiful Nation will launch its first online fundraising event through Kickstarter. If you are interested in hosting a Kickstarter launch party in your community to help raise awareness about the project? Send us an email! 9. Sponsor a passage! Makulu will visit more than 35 ports of call on her circumnavigation. You can support the digital media content being produced about a particular region by sponsoring a passage through the region. This will ensure students have rich stories, photos and videos from the region and show your business as a an international partner. Contact us using the form below for more information on sponsoring a passage. 10. Donate! Click here to make a tax-deductible donation to Beautiful Nation today!